Stuart is home to two libraries for students from preschool through grade 12. In fulfillment of Sacred Heart Goal Two, a deep respect for intellectual values, the Stuart libraries serve as an intellectual resource to students and faculty. The libraries provide physical access to materials and information both in print and online. Both libraries also provide students and faculty with a number of multimedia resources including digital cameras, HD camcorders, LCD projectors, iPods, audiobooks, and mobile sets of iPad carts and laptop computers. The Raissa Maritain Library serves Middle and Upper School students in grades 5–12. The physical collection includes approximately 16,000 items—books, DVDs, CDs and print periodicals—searchable using the Web-based catalog. Students may also utilize, through the Raissa Maritain Library Web page, a vast virtual library of research tools and information sources. Igniting a love of reading and literature is at the core of a Stuart education for our youngest students in preschool through fourth grade. 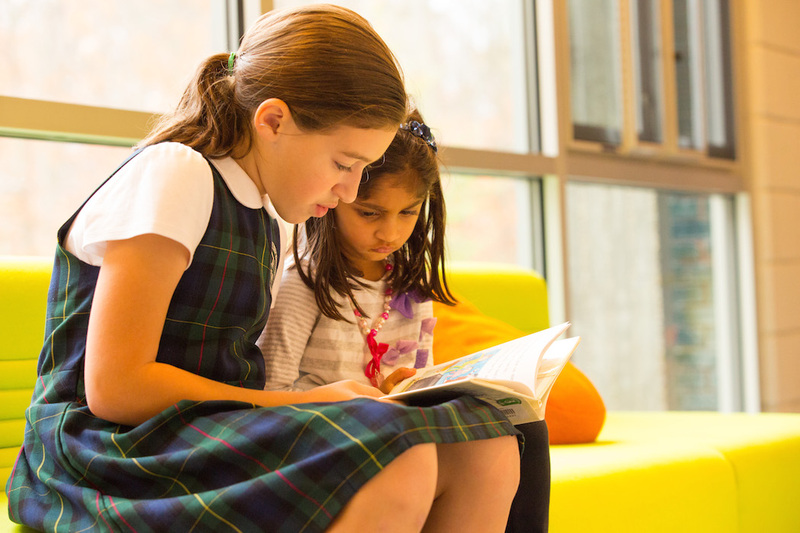 Our Lower School library is at the center of Millie’s Garden, the innovative hub of our Lower School. Books are an integral part our our girls’ learning environment, readily available at their fingertips, should students find something that peaks their interest or want to explore a new subject. The collection includes books and selected periodicals and electronic media. The online collection features subscription databases, vetted study resources, and copyright-free image collections. The library is also home to the mobile collections of MacBooks, Chromebooks, and iPads.